... with boughs of holly, fa la la la la, la la la la! This well-known tune appears to come from Wales, possibly from the 16th century, and belongs to the so-called canu penillion dull y De tradition, where dancers would dance in a ring around a harpist. The verses would be extemporized, and a participant would drop out when he or she would fail to sing a new verse. Originally, the harpist would play the “answering bars” (“Fa la la la la”, etc. ), but these nonsense syllables were substituted when harpers began to disappear. The first published lyrics for the piece in Welsh bore the title “Nos Galan” (“New Year's Eve”). In the eighteenth century the tune spread widely across Europe. Even Mozart wove it into his Sonata in G for violin and keyboard K. 301, commonly identified as “Sonata No. 18”. The Austrian composer may have heard the Welsh folk song during his boyhood visits to England. The American text of “Deck the Halls” first appeared, without music, in a New York newspaper, in 1881. 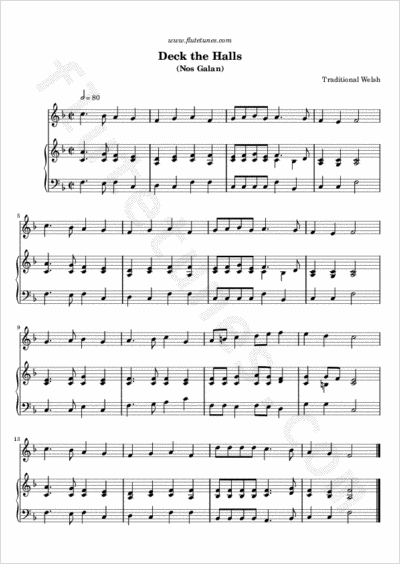 How the tune got wedded to the text is uncertain, but by the turn of the century “Deck the Halls” as we know it was already part of the American carol tradition.